Now you can create stunning live multi camera productions at 4 times the resolution of 1080HD! 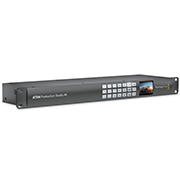 ATEM Production Studio 4K lets you connect up to 8 SD, HD or UltraHD 4K video cameras, disk recorders and computers for true broadcast quality work. It includes all the features you expect from a professional switcher including chroma key, transitions, media pool, downstream keyers, audio mixer, multi view and the world's first 6G-SDI and HDMI 4K video connections. Professional Live Coverage - Advanced technology and powerful features. Push the standards of live content production beyond broadcast quality! Ultra HD 4K cameras, projectors and super large screens at live events are new opportunities for content creation. With ATEM Production Studio 4K you can mix live programming and output at Ultra HD 4K resolution for an incredible audience viewing experience. With this single rack unit digital production switcher you can work in SD, HD or Ultra HD 4K and turn any live music event, sporting event, theater show, church service, conference and more into an amazing live television production!